They Need You To Walk for Life! Earn a T-shirt. . . There are two great ways to receive a T-shirt: Collect pledges for at least $150.00 or donate your own gift of $25.00 or more. To be eligible for a free T-shirt, you must turn in your sponsor sheet and collected pledges by the day of the Walk For Life. Earn Other Free Stuff. . . Walk For Life caps for 2019 will be awarded to walkers with $500 in pledges. Those with $1000 in pledges will receive a 2020 Walk For Life zippered sweatshirt when they come out next year. Win Great Prizes . . .
Prizes will be awarded to the three walkers collecting the highest amount of donations. Prizes will be awarded for 1st Place, 2nd Place, and 3rd Place. 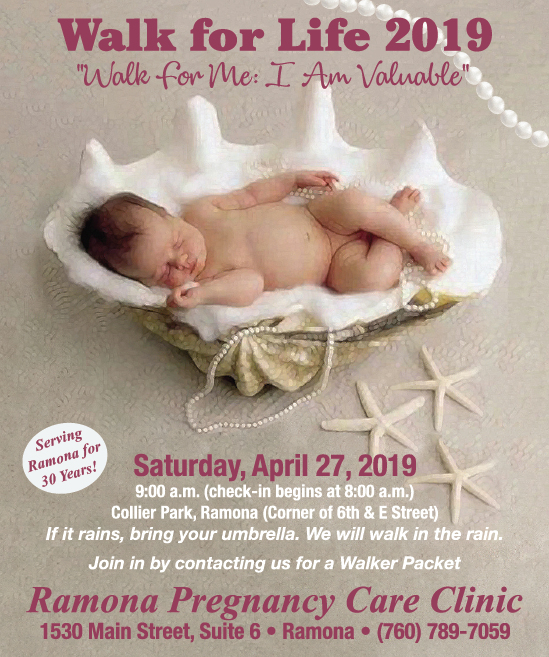 In order to qualify for prizes, your sponsor sheet and collected money must be turned into Ramona Pregnancy Care Clinic on or before Saturday, April 27th. It’s Easy. Create your own online walker page here, sign-up at your church registration table, or contact us in the office and we will send you a walker packet. Then ask family and friends to support your efforts.